Look, it's me. Where the heck did I disappear to, you may (or not) be wondering? I meant to do a little vacation slide-show here first as my welcome-back, but all my pictures aren't uploaded yet. So for now, I'll just say that earlier in the month, we were here. And then just yesterday, I returned from an anniversary weekend here, with the hubby of eleven years. 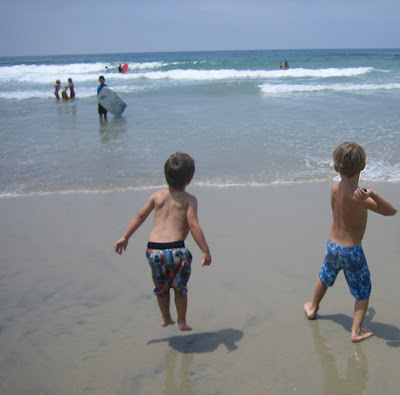 That's my little guy, jumping for joy at being back at the ocean again. He tells me he wants to be a surfer, "when he's big." He's already getting so big. But I digress. 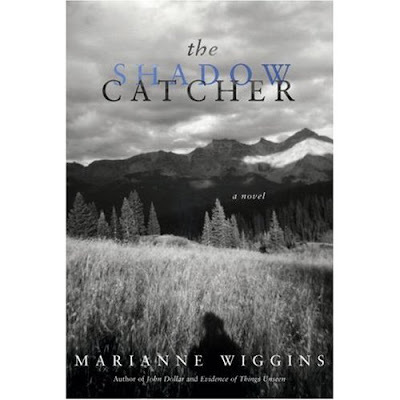 What I really came to talk about tonight was the last good book I read, a really terrific read called The Shadow Catcher, by Marianne Wiggins. I picked it up in the bookstore at the Mandalay Bay shopping mall in Vegas, which surprisingly has more good literary books and lit-vibe packed into its small walls than the big, Christian-heavy B&N here in my town. So there was a lot to choose from, and several books that I picked up and put down again. But I came back to this one in the end. One of my favorite subjects to think about as a writer is the West, the mythical west of imagination and dreams, the one that Sam Shepard is also a native of. And this book is about that west, the west as a created, fictional place that was sold to Easterners way, way back before Hollywood was even a thought. The novel is a twin narrative, first with the narrator, whose name just happens to also be Marianne Wiggins, who just happens to be a writer living here in So.California (the "real" Wiggins lives here and teaches at USC). In the opening chapters, we learn that the Wiggins character has written a novel about the life of the very real Western photographer, Edward S. Curtis. Curtis set out to document the West that was dying (or was perhaps even already dead) and the Native Americans who were disappearing from the landscape. Curtis was and remains a controversial figure, as it's up for debate as to whether he was truly honoring the Natives, or merely exploiting and romanticizing them. The second narrative is a historical fiction, with the main character of Clara, the name of the woman who became Curtis' wife in real life. We get to know Clara, from an educated, artistic family, and how she travels west to the wilds of Puget Sound in the late 1800s and meets and marries Curtis, a poor and uneducated young man with big ambitions, who believes that Clara's role is to teach him all she knows, so that he can learn and travel forth in the world to explore the new art form of photography. So the 2 narratives weave back and forth, with occasional black & white photos, many that are actually Curtis' works, interspersed throughout the text. But the real text, or subtext, of this book for me is the subject of fatherhood, and masculinity, and just how some men can behave like such rakes, and yet are revered and worshiped -- while the mother, back at home, takes the blame for all the faults and flaws of the marriage and family. I might know a thing or two about this, myself. For Curtis left Clara and their children, to explore his mythical West, and to mythologize his own self within that West, as he hobnobbed with Teddy Roosevelt and the railroad barons who plowed down the landscape and the people for their own gains. Curtis took off, first for weeks, then months, and in the end for years at a time -- and yet it is he who is the revered one in the family lore. I might have a thought or two on that subject, myself. He became, by disappearing from their daily lives, not a father, but the myth of one, a myth they needed to believe in to survive. And despite his actions, despite all contrary evidence, they needed to sustain that system of belief, even if it meant altering their memory, creating a false memory, a false identity, of who their father really was. Ah, yes. Again, something I might have a thought or two about. In addition to the shadowy dad of Curtis, Wiggins also writes about her own father (fictional or not) and how he disappeared one day, and was found years later, a suicide hanging from a tree in a state park. This part of the novel, and the mysterious man dying in a Vegas hospital with her father's ID and newspaper clippings about his daughter "Marianne Wiggins" found in his wallet, is probably the weakest (and most preposterous, in the end) but I still enjoyed the ride. I also found it funny, a day or two after we'd returned from our own Las Vegas road trip, to be reading Wiggin's accounts of taking the same Vegas back-street shortcuts that we had, and describing Barstow and Baker (including a pit stop at the iconic Mad Greek cafe), as we'd just blown through, ourselves. I should also mention that a large part of my connection and affection for the book stems from the fact that my dad, when alive, was an avid collector of many Western photographers, and spent quite a bit of money on old books, bought on Ebay, that he would show off to me when I'd be over for a visit. I feel a bit ashamed to admit that I can't quite remember if Curtis was one of the photographers he collected, although I'm 90% positive that he did. Next time I'm visiting my mom, I need to poke around in my dad's dusty closet and see what I can find. In any case, I found the book a rich and layered read, one of the best of my year -- (again, a starred review in Publisher's Weekly) and it also made me miss my own shadow-dad terribly. I would have loved to talk about this book, and his books, with him. And, hello -- stop the freakin' presses, too: I just went to Wikipedia to include a link to Curtis' bio, and what do I learn, right there in the sidebar, but that Curtis, who was down on his luck in later years, went and died right in my hometown of Whittier in 1952! Just as my own dad did, not two years ago. Oh, it's all connected, you see? Now for a mini-rant: I was appalled to learn as I read this Sunday's Los Angeles Times that they are eliminating all future editions of the Opinion pages, and the Book Review, and the Real Estate section -- all favorites to read with a cup of coffee and my peanut butter toast, and major reasons why I subscribe in the first place. God know what other small blurbs I missed, informing me of which other sections will be leaving. Is the much-shifting, ever-tweaked Magazine out of commission yet again, too? For I probably would not have picked up Shadow Catchers, if I hadn't already read Wiggins' earlier novel, Evidence of Things Unseen, about an average Joe and his major love, set against the backdrop of the Atomic Era. And the reason I read and bought "Evidence," is that I'd been intrigued and inspired to pick it up, owing to the 2-page glowing review of it that appeared in the Time's Book Review a few years back. You see how these things work, people? It's all connected, we're all connected, but how can it work if a major force and proponent of the literature of California and the West, as the Book Review has striven to be, is yanked from beneath our feet? For shame, for shame. Shall I tender my notice of cancellation? I can't decide if that would help, or hurt the cause of us blue-stockings, out West here in our flip-flops and denim shorts. GIDGET 4th of July MARATHON. I immediately started jumping up and down and pumping my fist, like my team just won the Superbowl or something. Well, yeah --- we kinda did, now that I think about it. The kids looked amused, and then a little alarmed, when I kept on jumping after the commercial was over. Then I grabbed the remote, and thanks to Tivo, watched it one more time. C'mon man...Gidget! Gidget used to run on syndication in the late mornings some time back when I was either a senior in high school, or had just graduated and hadn't yet found a job. Gidget reminds me of warm summer days in our apartment as I watched with my little sister, nine years my junior. We both loved the clothes, the sets, the silly escapades that Gidget always tumbled into each episode -- and oh, how we loved LaRue, her best friend. Gangly, awkward, nerdy LaRue, always scowling and sporting a huge, floppy hat against the summer sun as they sat on the beach, plotting their next move. 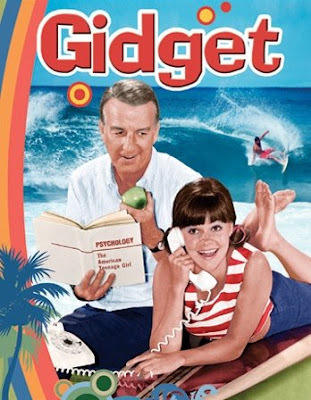 Gidget is quinessential California, starring Pasadena-born Sally Fields, and though this native Calif girl has never surfed (or wanted to) , Gidget is just way up there on my list of Favorite Things Ever. Kudos to brilliant KTLA for knowing exactly what I needed to kick off the holiday and our summer getaway. Have a happy 4th, and as Gidget says each time she hangs up her Princess phone: "Toodles!"